Angie is available on Tuesday, Wednesday, Friday and Saturday. Angie finished her Dentistry training at La Trobe University in Bendigo, during which she spent five years in beautiful country Victoria. After moving back to her home town of Melbourne, she was selected from the top graduates of her year by the national Voluntary Dental Graduate Year Program to work in a high needs community setting. In order to give back to the community, Angie worked as a public health dentist for three years, and also took up a casual teaching position at La Trobe University to help the next generation of graduating dentists. 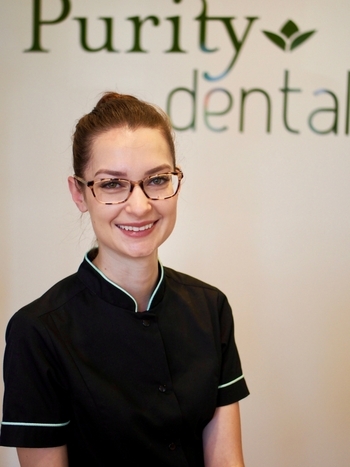 With her friendly and gentle approach, Angie believes in making patients comfortable through every dental experience, so that past dental fears or anxiety can be turned into positive dental experiences. With modern advances in dental technology, it is possible to have low or no pain dentistry, and Angie has successfully converted many anxious patients into regular attenders who are no longer scared of coming to the dentist. Her interests include preventative dentistry, to assist patients in maintaining healthy teeth and gums for the long-term, as well as restorative dentistry, which enables patients to achieve the smile and function they desire. In her spare time, Angie works as an editor, helping dentists from around the world submit research papers for publication in respected international dental journals. Living in Melbourne, she also enjoys sampling all the delicious cuisines that this city has to offer.